Claude Hitching is a retired Management Accountant, and started to research his family tree in 1999. He always knew that his grandfather, Fred Hitching, worked for James Pulham and Son as a ‘Rock Builder‘, and soon discovered that no fewer than five of his ancestors – including his grandfather and great-grandfather – all worked for the firm in the same capacity. He had, because Claude spent the next ten years researching the family and their business, during which time he was privileged to visit many wonderful Pulham gardens in places where he would never otherwise have been able to visit, and meet many fascinating people whom he would otherwise never have met. They were all only too happy to discuss their gardens, and to find out more about the people who constructed them so long ago. 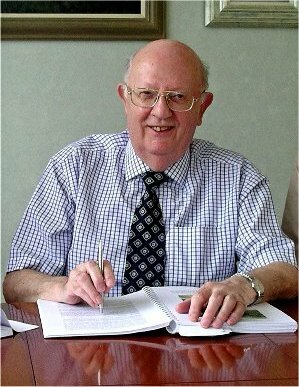 Claude received endorsements and encouragement for his research from several National organisations, such as English Heritage, the Garden History Society and the National Trust, and he decided to set up this website devoted to the Pulhams at www.pulham.org.uk in 2003. Traffic increased steadily to several thousand visitors per month, and his reputation as ‘The Pulham Expert’ spread to the point where he has been able to assist a number of local authorities and organisations validate the provenance of their parks and gardens, and thus qualify for Heritage Lottery restoration grants. The work never stopped. He thought he had finished his research several times, only to receive a call or an email from someone with a new enquiry, or new information that sent him off on further travels. In the end, however, he had to draw a line, and produced the book that includes detailed reviews of about 40 of Pulhams’ most prestigious assignments. There are many more for which space was not available, however, so some of those will be included in the ‘Site of the Month‘ feature on this website. Make sure you don’t miss them. I am contacting you from a company called North One Television, who are producing a new series for BBC One called ‘The Railway That Guy Built’. This is the follow up series to ‘The Boat That Guy Built’ which aired earlier this year. In one of the episodes from this series, Guy will be renovating a railway station, and, as part of that, we wanted to recreate an authentic 19th century garden fit for a station master. We wondered if we can use authentic and original techniques to build a rock garden and fountain out of Pulhamite. We shall be following this up with interest. I had never heard of Pulhamite until a few hours ago when I visited the gardens and grounds of The Royal Albert and Alexandra School in Gatton Park,Merstham,Surrey.The Gatton Trust is renovating the landscape (originally by Capability Brown) and Pulhamite was originally used in ithe construction of the Victorian rockery-it said so on a notice-which is where I came across it.Now,I see that it was used in a nearer garden at Coombe Woods which I visit regularly.I shall do so with keener interest in future.